I saw this book on the shelves in my local booksellers which are usually reserved for books which are new, interesting and likely to sell a lot of copies. They were right on two out of three, but they were in cloud cuckoo land on the ‘lot of copies’ part (unless we get a ‘Brief History of Time effect’ where lots buy it and don’t read it). This is a new and interesting book, and for the niche it is aimed at it is brilliant – but that is a narrow niche indeed. Usually there are two kinds of science books. Popular science explains what the discoveries and theories of science, with historical perspective, so that the general reader can get a feel for them – but reading a popular science book on, say, quantum mechanics would not leave you able to solve quantum mechanics problems. Textbooks, on the other hand, teach the actual science itself, usually with a lot more maths, so that you can indeed do the workings, but they don’t give you any context, and they are inaccessible (and, frankly, highly boring) to most readers. The only thing I’d criticise (apart from the narrowness of that niche) is the really irritating attempts at folksy fictional openings to the sections. They don’t work. Stay with what you’re trying to do, guys, don’t try to be entertainers. For most popular science readers this book simply won’t work. It makes the infamously ‘I started it but couldn’t finish it’ Brief History of Time look highly simplistic and non-mathematical. And for serious physicists, it’s still too limited – though it takes what is in some ways a better approach, giving more emphasis early on to entanglement, than the way quantum physics is traditionally taught. 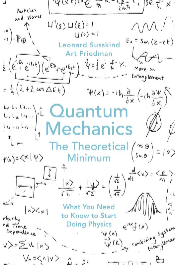 Either for those about to start a university physics course who want some preparation, or for someone who finds popular science explanations too summary and is prepared to take on some quite serious maths (A level maths required as a minimum, I would say) it’s a fascinating addition to the library. For the rest of us, probably best to leave it where it is.